In Stock This item has been discontinued. The Omega C-10W is Omega's NEW Commercial Citrus Juicer. This juicer has ETL sanitation certification, which is equivelent to NSF sanitation certification, which means this machine can be used in restaurants and juice bars.. This is juicer bar quality for your home. The Omega C-10W Commercial Citrus Juicer is a powerful professional citrus juicer. Easy to use and clean, the Commercial Citrus Juicer allows you to create high quality and nutritious citrus juices in the comfort of your own home. Unlike most other citrus juicers, this juicer includes 3 different size juicing cones to assure you get the maximum extraction for specific citrus you are juicing. 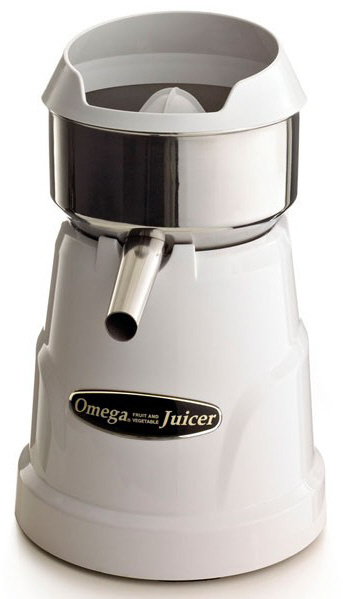 The Omega C-10W juicer's unique streamlined design includes a surgical stainless steel bowl and pulp strainer, convenient splash guard and non-slip feet. The Omega Commercial Citrus Juicer's one-speed operation makes it one of the most user friendly juicers on the market. Simply flip the switch for maximum juice extraction and minimal effort. The Omega Commercial Citrus Juicer's attractive white finish and small footprint make it a welcome addition to any kitchen. Cleanup is a breeze with this juicer, because there are minimal parts to clean and it is easy to assemble and disassemble. Hand washing with mild detergent is recommended for all detachable parts. Stainless steel parts are dishwasher safe. Plastic parts are top rack dishwasher safe, using a no heat drying cycle. Designed Specifically for juicing all citrus fruits - Lemons, Limes, Tangerines, Oranges, and Grapefruits.